Dell and Alienware launched a comprehensive new range of consumer, small business and gaming PCs in concert with the Intel 8th Gen processor launches yesterday. For PC gaming the brands introduced their most powerful laptops ever in the shape of the Dell XPS 15 and Alienware 17. 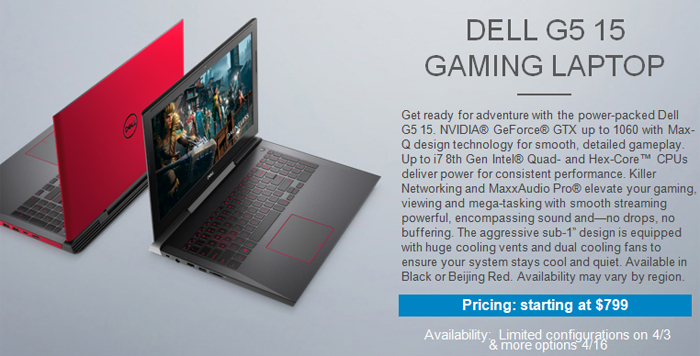 Dell also launched the G3 Series of 15- and 17-inch laptops, offering performance gaming with discrete graphics starting at just $749. One other new Dell machine that particularly caught my eye was the new Dell XPS 15 2-in-1 which is featured on the Direct2Dell blog. The XPS 15 is now configurable with the latest hexa-core Intel 8th Gen Core processors and up to Nvidia GeForce GTX 1050Ti graphics. Featuring a 15.6-inch screen in a 14-inch class chassis thanks to Infinity Edge, the new XPS 15 delivers 100 per cent Adobe RGB colour gamut on its 4K display. Dell claims that the XPS 15 is built from premium materials and is available in several attractive finishes including the new platinum silver. Battery life is claimed to be up to 21.5 hours, a record for a 15-inch laptop. The XPS 15 tips the scales at less than 4lbs / 1.8kg. The new Dell XPS 15 is priced from $999 with availability from May 2018. Dell claims the XPS 15 2-in-1 to be "the most powerful 2-in-1 ever". Yes, it uses an 8th Gen Intel Core mobile processor, this time partnered with AMD Radeon RX Vega graphics with 4GB of dedicated HBM. Dell has selected a 15-inch 4K resolution touch display panel with Infinity Edge and again it delivers 100 per cent Adobe RGB colour gamut. As well as your fingers you can use the touch panel with the Dell Premium Active Pen for 4096 levels of pressure sensitivity and tilt functionality. Only 16mm thick, this is also the most compact and slimmest 15-inch 2-in-1 available, says Dell. An innovative maglev keyboard design helps Dell achieve the slim profile. Another interesting choice among the premium construction materials is the use of GORE thermal insulation material. Battery life is claimed to be up to 15 hours. The new Dell XPS 15 2-in-1 is priced from $1499 with availability from Spring 2018. These unashamed gaming machines feature up to 8th Gen Intel Core i9 K-Series processors. Alienware claims it uses the best premium materials such as anodized aluminium, magnesium alloy, steel-reinforcements, and copper thermal management to ensure a level of stiffness, rigidity, thinness, and high-quality feel. An improved thermal solution works together with the hinge-forward design to keep your machine and you cool. RGB LED lighting is intergated with 13 unique programmable lighting zones. Various AMD and Nvidia GPUs are available and configurable and you can also plug in a desktop GPU via the optional Alienware Graphics Amplifier. Screen choices are up to an 120Hz TN+WVA 400-nits display designed for Nvidia G-Sync. On board audio benefits from an improved speaker design and includes internal smart-amps. Enhancing your gaming experience there are supporting technologies such as an upgraded Alienware TactX keyboard, with n-key rollover is now supported, 2.2mm key travel, and reinforced steel backplate. All configurations include Killer Networks e2500 Gigabit Ethernet and Killer 1550 Networks 802.11ac 2x2 Wireless with Bluetooth 5.0 technology. Conenctivity is ample with 3 USB 3.0 ports, one of which includes PowerShare technology, another of which uses a Type-C connector for Type-C compatible devices, plus 1 Thunderbolt 3 Port (USB Type-C) capable of SuperSpeed USB 10Gbps, 40Gbps Thunderbolt, and DisplayPort. In addition to the iconic Space Grey colour the new laptops will be available in Epic Black. These new Alienware laptops will become available from 5th April. A trio of new laptops with discrete Nvidia GPUs and backlit keyboards enter this stable; the Dell G3 15, G3 17 and Dell G5 15. The numerical suffix refers to the screen size. Dell G3 15 and 17 laptops are powered by Nvidia GeForce GTX 1050 up to 1060 Max-Q discrete GPUs, up to 8th Gen Intel Core i7 CPUs, dual fans and dual drives with SSD options. 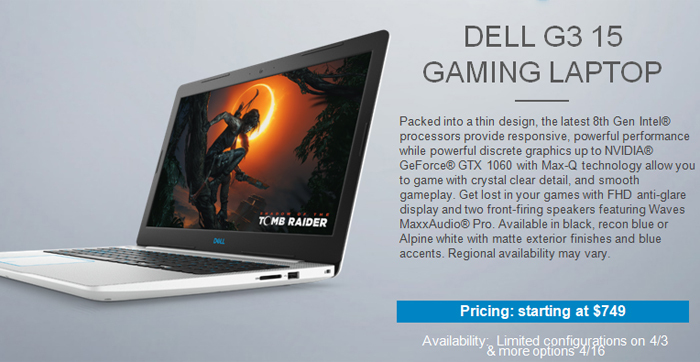 The G3 15 is Dell's thinnest gaming laptop to date and measures 22.7mm thick (the 17-incher is 25mm thick). Dell G3 15 will offer three colour options (Black, Recon Blue, Alpine White) and Dell G3 17 will offer two colour options (Black, Recon Blue). Offering a step up from the G3 systems the Dell G5 15 comes in a sleek 25mm thin 15-inch chassis, with powerful Nvidia GeForce GTX 1060 GPUs (6GB GDDR5) with Max-Q design technology plus dual fans, and dual drives with SSD options. Killer 1x1 networking optimisation (supporting up to 2x2) is present. 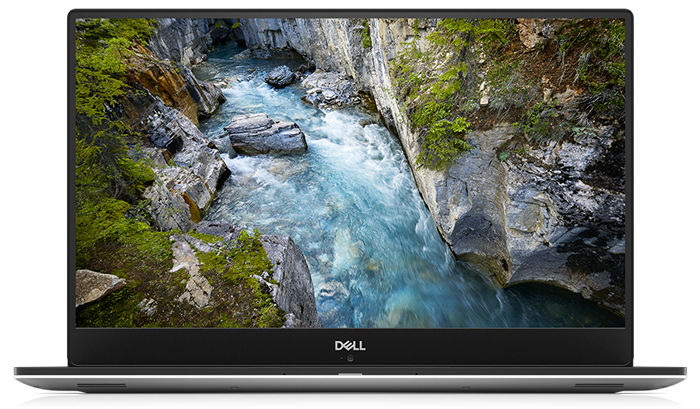 The Dell G5 15 will also offer an optional IPS UHD 4k panel. Dell's G3 15 will be available from mid-July. The Dell G3 17 will be available from 26th April on Dell.com with limited configurations now and more coming soon. Dell G5 15 will be available 3rd May on Dell.com and select retailers with limited configurations now and more coming soon. Question - do these chips have hardware based Spectre / Meltdown protection or are they reliant on the patches? If they rely on patches then you'd be mad to buy them. Especially if the SSD is NVMe where performance impact of the patches is huge.